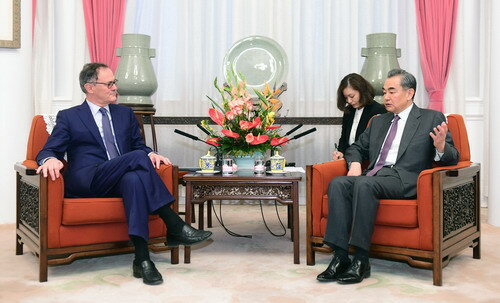 On March 1, 2019, State Councilor and Foreign Minister Wang Yi met in Beijing with visiting Co-chair of the Intergovernmental Negotiations on the United Nations (UN) Security Council Reform of the 73rd Session of the UN General Assembly and Permanent Representative of Luxembourg to the UN Christian Braun. Wang Yi noted that at present, the biggest challenge facing the international community is that unilateralism is on the rise and the multilateral mechanism is under attack. We should strongly support the UN in playing its due role. To this end, it is necessary for the UN to keep pace with the times, promote reforms, improve efficiency and earnestly fulfill its obligations entrusted by the UN Charter. Reform of the UN Security Council should adapt to the reality of international politics, and increase the representation and voice of developing countries and small and medium-sized countries, truly reflecting international fairness and justice. All parties should center on this right direction to reach extensive consensus through democratic consultations, and ensure that the reform of the UN Security Council conforms to the purposes of the UN Charter and the common interests of all UN members. 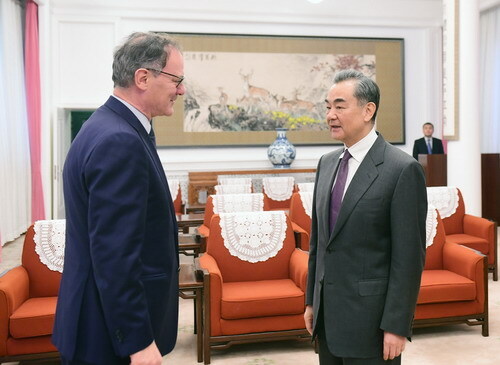 Christian Braun expressed that I came to Beijing this time to have negotiations with the Chinese side on the reform of the UN Security Council. Both sides have conducted constructive and in-depth communication. I totally agreed that the reform of the UN Security Council should be a gradual process with inclusiveness and transparency and should be advanced on the right track in line with the common aspirations of the UN members.